Karnataka state is located in the south western part of India. It was formed on 1st November 1956. Bengaluru is the capital and largest city of this state. It is home for several reputed institutions like NIT, IIIT & many other public and private colleges. These engineering colleges offer a wide range of specializations for UG & PG engineering courses. The literacy rate of Karnataka is 76 %, according to the census 2011. 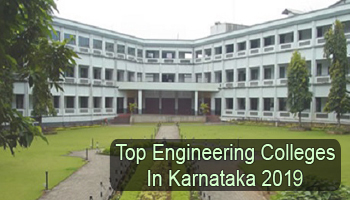 Through this article, students can check the list of Top Engineering Colleges in Karnataka 2019. Here at Sarvgyan.com, we have provided a list of top engineering colleges in Karnataka 2019. This list includes the top colleges like National Institute of Technology (NIT) – Surathkal, International Institute of Information Technology (IIIT) – Bangalore, etc. There are various important factors that have been considered while rating these institutes. The institutions have been rated on quality of education, placement statistic, college infrastructure, student’s preferences, college affiliation & approval, faculty ratio, facilities provided by colleges & many others. There are two state-level examinations that are conducted in Karnataka for providing admission in B.Tech course. Students can apply through KCET (Karnataka Common Entrance Test) or COMEDK UGET examinations. JEE Main scores will also be considered for providing admission in engineering courses. The application form of these entrance tests will be available through online mode. In M.Tech programme, admission will be done through GATE examination. In Karnataka, various colleges & institutions offer different specializations for engineering courses. Some specializations which are trending among the students in Karnataka state are Computer Science & Engineering, Civil Engineering, Mechanical Engineering, Electronics & Communication Engineering, Information Technology and Chemical Engineering. If you have any other queries about Top Engineering Colleges in Karnataka 2019, you may leave your queries below. which are the best eng colleges in northbangalore please let me know. and how is saividya institute, sir MVIT and atria institutu .please let me know. out of which universities have thier online application form available now ???? I hv scored 13962 in JEE Paper II, pls suggest me from which college I can get admission in Karnataka and also admission procedure. I am from Telangana and I am interesting to complete b tech in correspondence. Present I am working in MNC company in Dubai. Kindly advise any possibility to reach my goal. You can get admission in Karnataka engineering colleges only through JEE Main entrance exam.